Commenting, reviewing or adding to something that David Foster Wallace has written is few notches above my abilities. There are some writers that you like and some others that you love, but there are very few that you really respect. Foster is probably the only writer for whom I have great respect, not because he writes so well as his brilliance, his wit, his keen sense of observation are all a given, but for his humanity and the way he makes me feel ashamed of myself every so often. I who often think of myself as sensitive, original, sincere, witty and profound am no more than a creature of pretensions and a prisoner of my self-interest. This is the uncomfortable message I receive every time I pick up something from Foster. That is why it is always such a hard decision to read his work knowing that you will be humbled in the process. 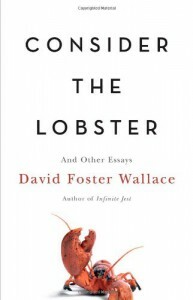 I only want to record my observations on the title piece, that is, “Consider the Lobster” in this entirely outstanding collection of Foster's Essays. Another one worth mentioning is "Up Simba" which is an account of days spent on Senator McCain's campaign trail in 2000. Most of those who will find time to read this must have noticed my proclaimed love for animals and in general all life forms. Well, don't be fooled by that. I think it's a lie, some pretension that I came up with while drunk with a vision of my goodness. Because if this is true, then why am I not a vegetarian? Why do I mock vegetarians with all the nastiness that I can muster? What is your opinion of someone who has been scheming all along to kill and eat those he claims to love? Certainly I don't hold that person in a very high regard. 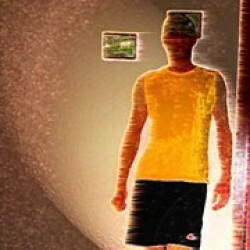 But in this case I am also faced with a moral dilemma, because that person is myself. Now here is a test of character, I can condemn myself and admit that I am dishonest and a liar or seek justifications for my actions. Now consider the case of lobster. One of my countless conceits is to promote myself as a great connoisseur of such delicacies. "I like them fresh and I like them grilled!" is a slogan by which I thrive and maintain supremacy in my social circle. So on any given evening, I would descend along with few cronies at the restaurant managed by my brother, and shame them into trying it out. They would agree because not doing so would be so un-hip and un-cool. Most eager among them would be that pretty young thing whom I want to impress this evening with my knowledge, my wisdom and my worldly ways. Then I would demonstrate my command of the intricate methods and procedures involved in "preparing" the lobster as well as the general esteem in which all the staff at the restaurant holds me, not because I am the manager's brother but because of my overly (and incorrectly) advertised knowledge of culinary matters. How naively arrogant one can be! Anyway, I would offer them to see what is actually going on in the kitchen while this great crustacean is brought towards its inevitable doom. "I like to personally prepare my lobsters, because I want to honour them (in some cryptic tradition of my forefathers from pre-cambrian periods that required killing the prey yourself to honour it)" - but this is just another of my empty slogans as I envision their sweet, succulent meat savoured in a frenzy of gastronomic impudence before ending up in my digestive tracts. Where is the honour in this?". Well those of you who do not know what this seemingly innocuous word "prepare" means in a lobstrian context, let me give you a synopsis. You fill a large kettle with water and set it to boil. Do not forget to add two tea spoons of sodium chloride (which is the ordinary table salt). Now the real fun part: take out your crustacean friends from the large glass jar in which you are keeping them and in which they are alive and kicking and put them in the kettle in which the water has reached the boiling point. All the cronies are eagerly watching as the poor things scramble about the kettle in obvious pain and possibly disgust. The pretty young thing (whom I want to impress) is the bravest of them all as she watches the massacre with undisguised devotion, her eyes lit with strange primitive emotions as the lobsters writhe and squirm in pain. I believe she is secretly cheering them on in the manner of a pretty cheerleader who is indifferent to the fate of the players or the outcome of the game, but loves the accompanying mayhem and bloodshed. "Lobsters do not feel pain because their nervous system is wired differently", I triumphantly announce - an obvious lie of course, but a few lights are extinguished in the pretty young thing's eyes and a general air of despondence descends over cronies.